Theories of Attention-Deficit/Hyperactivity Disorder (ADHD) implicate dysfunctional regulation mechanisms that have been conceptually grouped into “top-down” control and “bottom-up” affective/reactive processes. This dual-process account can be invoked in relation to temperament or personality traits and may clarify how traits relate to ADHD. Two samples were examined to illuminate developmental effects. The younger sample was 179 youngsters aged 7 to 12 years (113 boys; 107 with ADHD). The older sample was 184 adolescents (109 boys; 87 with ADHD) aged 13 to 18 years. Structural equation models included parent-rated traits, teacher-rated ADHD symptoms, and laboratory-obtained executive functions. A control or “top-down” factor included cognitive control and conscientiousness/effortful control. A second factor labeled affective or “bottom-up” included neuroticism/negative emotionality, agreeableness, and reactive control. In the younger sample, these two factors were differentially and specifically related to inattention and hyperactivity, respectively. However, in the older sample, the first factor was related to inattention and hyperactivity, whereas the second factor was related to hyperactivity. 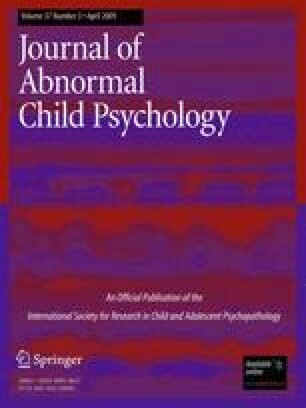 Personality traits appear to map onto ADHD symptoms in a meaningful manner consistent with a dual-process model of temperament and ADHD. This research was supported by NIH National Institute of Mental Health Grant R01-MH63146, MH59105, and MH70542 to Joel Nigg. Martel was supported by NIH F31 MH075533. We are indebted to the families and staff who made this study possible.